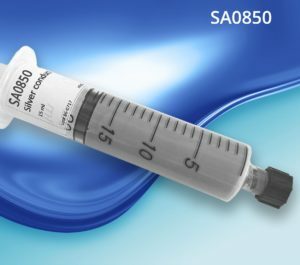 Working with Strem Chemicals UK to market their exciting new materials, our colleagues at DZP Technologies have released a unique one-part aqueous silver conductive adhesive which forms a flexible bond after curing at 120°C called SA0850. The conductive bond has excellent chemical stability once cured. Importantly, the bond retains its properties after exposure to 85% relative humidity and 85 ºC for more than 7 days. This feature makes the conductive adhesive truly unique and ideally suited to applications where moisture and temperature stability are critical. Examples include wearable electronics, smart textiles, medical bandages, and connecting rigid and flexible components to create hybrid electronics. The glue can survive at least 33% strain for more than 1,000 stretch cycles. In contrast to other conductive adhesives, this one-part product is stored at ambient temperature with a shelf life exceeding 12 months. Once opened, it can be used many times without deterioration of the properties. DZP Technologies is a leading developer of specialty materials, formulations, and technologies for emerging industries. They work closely with their customers to create innovative materials for a range of markets, from consumer electronics and wearables, to 3D-printing and renewable energy. Another material they make is carbon conductive ink which is formulated with fine carbon nano-particles. The ink can be used for high-resolution deposition and printing, providing smooth, high quality and uniform films. The obtained films have excellent mechanical properties, flexibility, and resistance to moisture and humidity. The carbon ink can be used to produce printed electronic circuitry, strain and capacitive sensors, NFC antennas, electromagnetic shielding coatings, and components for wearable electronics. Strem Chemicals UK is a part of Enterprise Plus, the Royal Society of Chemistry's dedicated service for SME's.